Numismatic Assets sells coins primarily to collectors. We work closely with collectors to develop goals for their collection, and to provide coins that offer superior quality and value. Since a rare coin collection can add up to a significant dollar amount, most collectors are very conscious of the value of their numismatic holdings, and consider their collections to be a part of their investment portfolios. This section of our website first describes in general terms the type of coins that we handle and explains how a collector goes about buying and selling these coins. Second it introduces some of the basic concepts involved when investing in rare coins. Coins, perhaps more than any other collectible, are valued according to their condition. Coins that have been used in commerce are called circulated coins. They exhibit varying degrees of wear or due to the amount of handling they were subject to. It is because most coins were produced in relatively high numbers that many are not rare in circulated condition, but they may be almost unknown in Uncirculated condition. Uncirculated, by definition means coins that have never been used in general commerce and therefore have retained the characteristics of newly-minted coins. These coins do not show any signs of wear. Other terms that are commonly used to describe uncirculated coins include “Mint State” (often abbreviated MS) This is the term that PCGS and NGC use on certified coin holders. Another term used prior to the advent of third party grading was “Brilliant Uncirculated” (often abbreviated as “BU”). Uncirculated coins are typically worth significantly more than circulated coins. Not all uncirculated coins are of equal quality. The differences in quality come from a number of factors including; defects in the minting processes, poor striking quality, or overused dies that resulted in the loss of some design detail. Some flaws were due to inferior mint equipment or planchet preparation. Coins were often sorted into bags after they were struck for transport to other banks. During transport, they may have become abraded by contact with other coins. This is often called “bag marks.” Some defects in quality may be a result of improper storage by collectors or other mishandling. As stated above, there can be variation in the quality of mint state coins. In order to differentiate between them, coins are assigned a numerical grade corresponding to their condition. Mint state coin grading starts at 60 on the numerical scale and ends with 70. The most seriously impaired coin that is still technically Mint State will be assigned a grade of MS-60. Mint State coins are graded on the basis of four characteristics: strike, luster, surface preservation, and eye appeal. “Surface preservation” includes the presence (or absence) of contact marks as well as any evidence of handling that the coin may show. “Luster” refers to the shine or reflectivity of a coin’s surfaces. “Strike” refers to the fullness of the design detail, often called a coin’s devices. “Eye appeal” is to a certain degree subjective, but a coin must meet a minimum standard of appearance to be considered a certain grade. These numerical grades loosely correspond to the adjectival grades that were used to describe coins prior to the advent of third party grading. This may shed some light on the differences between various grades. For example, Brilliant uncirculated now corresponds to coins in the MS-60-62 grade range. Choice uncirculated corresponds to the MS-63 grade and on coins that were once called near gems, today's corresponding grade is MS-64. A gem uncirculated coin is now called MS-65 or MS-66. Superb gem uncirculated is now considered to be either MS-67 or MS-68. Very few numismatic coins are ever graded higher than MS-68. Since 1986 coins have been authenticated and graded by independent third party companies, and then encapsulated in a hard plastic holder. This process is called “certification.” A small label within the holder identifies the coin and its numerical grade. Each coin holder also has a unique serial number. These firms that grade coins do not buy or sell coins but rather charge a fee for their services. We handle coins graded by two grading services: PCGS (Professional Coin Grading Service) and NGC (Numismatic Guaranty Corporation). Besides being the two largest grading services, they are known for their consistent grading and superior liquidity. Third party grading protects the collector in three ways. First, the coin is authenticated to make sure that it is genuine. This eliminates any possibility of the coin being counterfeit. Second, if you buy a certified coin that has been graded MS-65 by PCGS, it will be universally recognized as an MS-65. There is no argument regarding the condition of the coin when the time comes to sell. Before certification, collectors could buy a coin as an MS-65 paying a premium price for the quality. When the time came to sell, they might be told that their coin was only an MS-63 and worth substantially less then they were led to believe. Overnight, third-party grading eliminated this conflict. The third advantage to certified grading is that the above-mentioned companies guarantee their grades. For example, if you purchase a coin that you believe is lower quality than the grade stated on the holder you may resubmit it to the grading service for evaluation. Should the grade be lowered upon evaluation, the grading service will compensate you for the difference in value between the grades. 5. What About Proof Coins? Now that you are familiar with numerical grading, it makes sense to revisit our discussion of high grade coins. While uncirculated coins are very popular with collectors, so are Proofs. These are coins that were struck for presentation purposes or made expressly for collectors. The planchets (the metal coin blanks) on which they were struck and the dies employed were specially prepared. Proof coins receive two or more blows from the mint press (while coins struck for circulation purposes are only struck once) The result is a fully detailed coin, often with a mirror reflectivity to the surfaces or a cameo contrast between the devices (the design) and the fields (the blank area of the coin). Proof coins are graded numerically in a fashion similar to Mint State coins except they will be noted with a “PR” instead of an “MS” before the grade. For example, a Gem Proof will be graded PR-65. This PR designation is not a reference to its condition but its method of manufacture. Numismatic Assets deals in the finest quality certified rare coins from the United States minted between 1792 and 1955. This is explained in more detail below. All the coins that we sell have been graded and encapsulated by either PCGS or NGC. We urge very strongly that beginners and advanced collectors alike stick to coins that have been graded by these reputable third-party grading services. Since we specialize in rare coins, it is important to clarify what this means. Coins can be called “rare” for several reasons: few were produced, few have survived or few have surfaced in a high state of preservation. The first two reasons should be self- explanatory but the third may require some elaboration. Many of the twentieth century coins that we handle fall into this third category and can also be described as condition rarities. Here is a good example. A little over 2.8 million $20 St.Gaudens were produced at the Philadelphia Mint in 1925. A large portion of this original mintage has survived, but fewer than a dozen superb gem (or MS-67 examples) are known. While a heavily circulated example is worth only a little over its bullion weight, an MS-67 is worth around $12,000 and is the object of significant collector demand. Like we said, perhaps more than any other collectible, coins are valued according to their condition. We handle only U.S. coins. The U.S. rare coin market is substantially more sophisticated and better capitalized than any other. There is no comparison. While there are many interesting and valuable ancient and foreign coins, they are simply not traded in the same way. While we believe that there are considerable merits to collecting non-U.S. coins, they are just not something that we handle. And why 1792 to 1955? The U.S. Mint was authorized by an Act of Congress in 1792. While regular issue coins (coins for general commerce) were not struck until 1793, the first pattern coins were made in 1792; thus the starting date. We use 1955 as a cutoff date since most coins dated after 1955, we consider "modern" and don't believe that they offer much future potential due to their enormous mintages and survival rates. 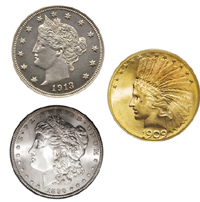 Here at Numismatic Assets, we specialize in early silver, copper and gold type coins. We also specialize in Morgan Dollars, dated gold coins and key date coins of nearly every series type. We are also very active in putting together registry sets for collectors. Click here for more information. If you are just starting out, you may be asking yourself, “what kind of coins should I buy?” There is no right answer here, other than you should collect what you like. You will be most successful as a collector if the coins you buy are interesting to you. You can take a look at the types of coins we have in inventory and visit our online library to learn more about them. Presumably an interest in rare coins led you to this web page. Whether it’s a memory of the Lincoln Cent album you kept as a kid or that $20 gold coin that you’ve had for years, you’ve got your own unique starting point. Regardless of what interests you, there is a general rule that should be followed when collecting: specialize. You should develop a degree of focus so that you can build a collection rather than an accumulation. You can narrow your collection to a specific series of coins or you can focus on coins with certain shared attributes in countless ways. We have written many articles on how to refine your collecting goals which can be found on our website here. If you are uncertain of what you want to pursue or are feeling unfocused, you should start slowly. Discuss your interests and collecting goals with a knowledgeable dealer as they are a great resource. Developing these goals is both a gradual and a progressive process, and your tastes will change with experience over time. This is one of the true joys of collecting rare coins. Ready to take the plunge? You can choose either online checkout or click-to-purchase options on our website. Most of the coins that we sell are not generic. To a great extent, they are one-of-a-kind items. So if you’re interested in purchasing a coin that we are offering, or you have any questions, send us an email or give us a call. We will be happy to tell you more about it so that you can make an informed decision. Furthermore, we offer a full 15 day return policy if you are not satisfied. If you are just starting out, let us know. We can make sure that you have the right reference books and make some suggestions about how you can learn more. One of the main things that we do as rare coin dealers is service want lists. This process is fairly simple. Collectors let us know what they are looking for and we find coins for them. A want list is a list of the coins that you are looking for, including the date, denomination (cent, half dollar, etc.) and condition (grade). You are under no obligation to buy so it’s best to look at this as a sort of notification service. When a coin becomes available that fits within your collecting guidelines, you will get a call or an email. You can fill out our online want list form here. 10. I’m Ready, Now What? So, you have a collecting goal, you’ve started buying rare coins, and are having fun learning all about your new numismatic endeavor. There’s no mistaking it now, you’re a coin collector. Fortunately, you’re not alone. There’s a vibrant community of collectors just like you. You can meet other collectors at a local coin club. National coin conventions, where dealers from all around the country gather, are held almost monthly. At a large convention, over $100,000,000 worth of rare coins can trade hands during the course of a week. Collectors exhibit pieces from their collections and various organizations hold seminars. We recommend that all collectors join the ANA (American Numismatic Association), which is the largest of all coin collector associations. There are online discussion forums, of which the most prominent are those on PCGS and NGC’s websites; And of course, hundreds of books on rare coins have been written to help you explore every possible avenue. We carry a full selection of numismatic books in our web store to help in this endeavor. Over the years, rare U.S. coins have proven to be one of the most effective of all investment vehicles. When purchased through a knowledgeable and reputable dealer, rare coins can provide an intelligent and profitable diversification to your overall portfolio. The fact is, rare coin investments are no longer going unnoticed by the investment community. Today, they represent an increasing share of many corporate pension and profit sharing plans and are frequently recommended by leading financial planners. Although past performance is no guarantee of future results, and investments in rare coins do involve risk, it is reasonable to surmise that quality rare coins will continue to provide a viable diversification to one's overall portfolio. Click here for more..
Rare U.S. coins are an ideal investment for the prudent investor. Many financial advisers recommend that investors place 10% to 20% of their discretionary funds in tangible assets to maintain a properly diversified investment portfolio. Rare U.S. coins have proven to be an excellent hedge against the effects of inflation. Although renowned for their performance in periods of high inflation, rare U.S. coins have generated strong long-term price gains in virtually every period of economic growth over the past thirty years. They can also be very useful in reducing the overall volatility of an investment portfolio because, on average, they tend to move in the opposite direction of paper investment vehicles. Thus, rare U.S. coins can provide investors with security and peace of mind. In 1986, several of our nation's leading rare coin specialists formed an independent certification company that would finally set a standard for grading & authentication. The formation of the Professional Coin Grading Service (PCGS) revolutionized our industry, making it safer for the novice collector/investor to acquire coins with the peace of mind that his or her coins were properly graded. In 1987, the inception of the Numismatic Guaranty Corporation (NGC) provided a competitor to PCGS. Although there are other grading companies, none deliver the widespread acceptance or consistency of PCGS or NGC. As an added benefit of certification, the coins are encapsulated in sonically sealed, tamper-evident holders which can provide safe, long-term storage. PCGS and NGC Third-Party certification assures the investor that coins are being properly represented as to their quality and rarity. Unlike other tangible assets such as jewelry, stamps or artwork, the rare coin market enjoys a very active trading environment with up to the minute 'bid' and 'ask' prices available for investors. This is facilitated by the Certified Coin Exchange. This specially designed computer trading network allows most coins to be traded in much the same way that individual stocks are traded on Wall Street. On a typical trading day, thousands of certified U.S. coins are bought and sold--sight-unseen--on this electronic numismatic exchange. At any given time, thousands of coin dealers nationwide can provide buy or sell quotes for virtually any rare U.S. coin. This degree of liquidity is possible because of independent grading by PCGS and NGC. No other collectible can offer such outstanding liquidity. In addition, there are other liquidation options such as selling directly to a dealer, on a consignment basis or through public auction. 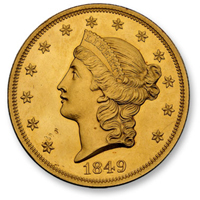 Numismatic Assets, Inc. can facilitate any auction transaction at favorable rates. Rare coins are one of the few remaining investments that can be accumulated privately. Because coins are highly liquid and easily transportable - and because an investor can take physical possession of his holdings - coins are attractive to investors who do not care to let the rest of the world know what they own. Unlike paper investments, rare U.S. coins have real tangible value that you can feel each time you hold one in your hand. Therefore, they offer two ways to build wealth. Carefully selected coins truly offer the best of bullion and numismatics in one investment. They contain the intrinsic security of bullion and can also offer profit potential regardless of the performance of precious metal spot prices. Still, precious metal content is only a relatively small factor in determining the value of many rare U.S. coins whose value is almost solely based on condition, demand and rarity. Premium quality rare coins are still affordable to the private investor. Despite their record of consistent price gains and the million dollar collections often sold at auctions, rare coin portfolios with outstanding track records and promising futures are available in a wide range of investment levels. Compared to other collectibles such as Old Masters paintings and investments such as real estate, rare U.S. coins are very affordable. Rare U.S. coins are a part of our history--direct links to America's rich heritage--and as timeless and valuable as history itself. For two centuries, U.S. coins have been symbols of American stability, as well as reflections of national pride. Throughout our nation's history, coins have spotlighted our national heroes, paid tribute to our great achievements and commemorated significant events. These truly historic works of art honor past sacrifices made in the name of freedom. Rare U.S. coins acquaint investors with historical figures and events, no matter how far removed by time. The satisfaction of actually owning a piece of history from a bygone era makes investing in rare U.S. coins truly unique. Each coin has traveled a different path through history, and as a result, each is a unique embodiment of the hopes and dreams of our founding fathers.